Boot flex numbers - this is the one number everyone seems to focus on, when selecting boots. Some recommend stiffer boots, some softer boots... what to do, what to do? While the stiffness indicator (flex number, from 50, 60, to 190 and up) does indicate that the entire boot is more or less stiff, it is mainly about the cuff, indicating that the cuff is easier or harder to flex/bend... so, to understand how we can use or select this number, let's look at what the cuff does for us. Most boot cuffs are stiff enough laterally, especially in relation to the overall flex of the boot, so the flex number indicates how stiff the ski boot is is in a fore/aft direction and specifically forward (the back of the boot cannot really be flexed). Most seem to agree that the main role of the cuff is to transmit power to the ski and bend the ski or lever the ski tip into the snow. It does seem intuitive and, while that's certainly one aspect of using the cuff, I will disagree with the prevailing opinion and state that the role of the boot cuff is not as much to leverage the front of the ski into the snow, but the main role of the boot cuff to support the skier and assist in re-balancing. The main role of the boot cuff to support the skier and assist in re-balancing! If one is on the cuff throughout the turn (i.e. trying to lever the tips into the snow) likely you're over-pressuring the tips, washing out the tails and overall be out of balance, as you're at the maximal range of movement in that direction! 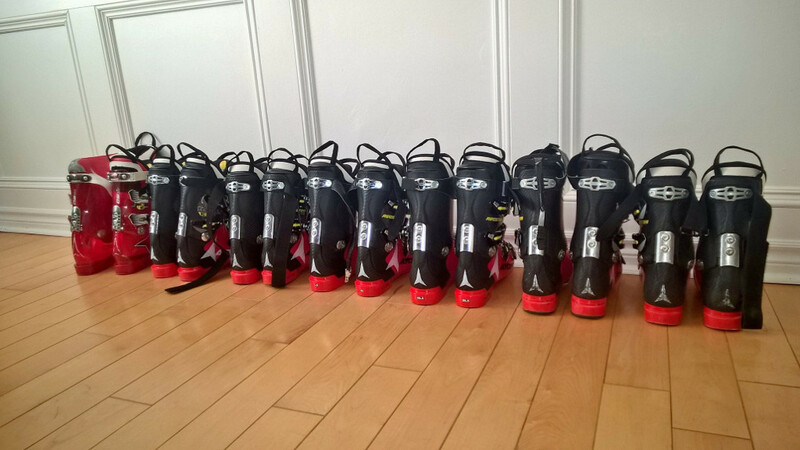 Most coaches prescribe soft boots for beginners (racers and recreational skiers alike) and, while there is an element of truth in that for very young racers, it is not neccessarily true for recreational skiers. A stiff boot does take some technique to ski well, as most would probably try to flex it to be forward, but that's not how it works. I can say that one step in my journey of learning to ski well was when I got into a broken boot, one that would not flex at all... and after a couple of days of hurt you start to understand how it works.
"" In the Goldilocks world of boots what is preferred. a little on the soft side of perfect or a little on the stiff side of perfect? I believe most with low experience would prefer the braced ankle overkill.. I like the way you put "braced ankle" though. That invokes painful race boot like tightness... and I think most would be better served by good tight fitting boots, so their ankles can become useful. But here's another angle on the "support" issue. How much can we flex the knees in stiff boots? Does bracing against the cuff apply to just skiing with more flexion, i.e. more dynamic? Warren W has a very good section on this issue and a good discussion of boot setup from this point of view (cuff stiffness, but also height and angle etc). Good question - the boot stiffness does impact the use of the ankles. The stiffness of the boot is more related to the range of motion of the skier and (re)balancing, i.e. being supported by the cuff. Beginners have a small range of movement fore/aft, are pretty static and tend to have boots that are not properly setup, so get bounced around by a stiff cuff, so most prescribe a soft boot for them. However, soft boots are like shoes... no point really. I would not ski below something like a 100, as anything above an absolute beginner - that was my first modern boot even before I could ski well (at 140lbs / 5'7"). My youngest at 13 skied a 110 boot - even total beginners in 110 boots are feeling better, because the boot does support them somewhat. That's not the entire story though. The length of the cuff is very important, the angle of the cuff, the way you put the boots on is important, the fore/aft setup of the boot is important and more... and of course, the skier's weight. The stiffness is just like 30% of the fore/aft equation... and I have 130 Heads that are stiffer than 150 Atomics... and I have 150 Dalbellos that rock it off the stiffnes scale and take 5 minutes to put them on (that's also all the morning warm-up one needs). So the numbers don't even mean that much. Bottom line, get a stiffer boot but set it up properly fore/aft, for you and you'll have a lot of fun. Viewed 709 times ( | Print ) this page.